The following sections explain the rules which govern all transactions that are effected through the tombola websites. Please read the terms carefully and ensure that you understand them fully, before agreeing to be bound by them. tombola is only available to residents of the UK (this includes membership for our online bingo games and online games). In order to play games on tombola, you will be required to register and make a deposit. Once registered and subject to satisfying verification, you can play the games. These terms and conditions will apply. They constitute your agreement with us and apply to the exclusion of any other terms that you seek to impose or incorporate or which are implied by trade, custom, practice or course of dealing. the individual game rules which can be found on the game rules link within each game. all such other of our Terms and Conditions, rules or policies as they relate to any applicable Services (e.g. rules for a particular game. ), promotions, bonuses, special offers or any other aspect of your use of the Services from time to time. and are deemed to have accepted and understood all of the above. Games on the website are operated by tombola (International) plc, a company registered in Gibraltar with company number 105556 and whose registered office is 7/9 Cornwalls Lane, Gibraltar. In these terms and conditions "tombola", "we" and "us" are tombola (International) plc and you are referred to as "Player", "Customer", "you" or "your". These Terms and Conditions represent the entire agreement between you and tombola, and your acceptance of the Terms and Conditions is an acknowledgement by you of your agreement to be bound by the Terms and Conditions. Any failure by us to enforce any provisions of these Terms and Conditions shall in no way be construed to be a present or future waiver of such provision, nor in any way affect the right of any party to enforce each and every such provision thereafter. The express waiver of any provision of these Terms and Conditions shall not constitute a waiver or any future obligation to comply with such provision or requirement. These Terms and Conditions are severable. If any term or condition is declared invalid, unlawful or unenforceable to any extent, that term or condition will to that extent be severed so that the remaining Terms and Conditions will continue to be valid to the fullest extent permitted by law. The agreement is made exclusively between us and you. You shall not be entitled to assign or transfer this agreement in any way. We are entitled to assign, transfer, charge or otherwise deal in our rights as we see fit. You can contact our Customer Services team 24 hours, 7 days a week by calling FREE phone 0800 29 888 73 / 0330 124 0700 or by email at [email protected]. We aim to answer all enquiries within 12 hours. An Account refers to the account you have registered and that is operated by tombola. Only one account per person is permitted. Pay to play games meeting the regulatory requirements of the Gibraltar Gambling Commissioner and the UK Gambling Commission. A person who pays to enter one of the Games. Money or goods won by a Player (also referred to as 'Winnings'). Full details on Jackpot and Game Prizes can be found within the individual game rules. A jackpot whose pay-out is incrementally increased every time a game is played. Player who wins a Prize. 2.1.1. You must be at least 18 years old in order to register and play any of the Games on tombola. We reserve the right to request your proof of age and evidence to verify your identity. We reserve the right to conduct checks against any of the details you provide through any channels or methods available to tombola. In such instances where we suspect you may be under 18 or tombola have been unable to verify your identity or age, your account may be suspended. Prohibit you from gambling until age verification has been successfully completed. 2.1.4 No winnings shall be paid to an underage Player. Tombola is only available to residents of the UK (this includes membership for our online bingo and arcade games). Some countries prohibit some or all of the forms of gambling available on these Websites. tombola does not intend that persons located in a jurisdiction in which such registration and/or playing any of the games is unlawful or contrary to any applicable regulation at the time of registration should play the games. It is your responsibility to ensure that this is not the case; participation in the games is void wherever prohibited by any applicable law. 2.3.1. In accordance with the legislation laid out by the Gambling Commission of Great Britain and the Gibraltar Gambling Commissioner, we may use and retain the information you have given us, or we already hold about you, or which we receive from any enquiry we may make with agencies to confirm your identity. The process enables us to open accounts quickly whilst verifying your age and identity and assists in fraud prevention. We will check any details you disclose against any databases (public or private) to which we have access and will keep a record of that check. You agree that we may process, use, record and disclose personal information, which you provide in connection with your registration, and that such personal data may be recorded by the credit reference agencies or us. On registration you are assigned a unique User ID along with your own choice of password. It is your responsibility to ensure you do not reveal your User ID and/or Password to anyone else. You are responsible for any stakes placed where your User ID and Password have been correctly entered. Should you have forgotten your password or suspect that someone else has learned of your unique User ID, please contact our Customer Services team immediately. We reserve the right to suspend or close your account and refund any balance of your account without further explanation. In this instance any outstanding credits will be honoured. 2.7.1. You are required to register a credit/debit card or PayPal to your account in order to commence gaming. The credit/debit card or PayPal account you use for your first deposit will become the registered credit/debit card/PayPal for your account and will be used for future deposits and withdrawals. Subsequent deposits will require you to only enter the amount you wish to deposit and the same card/PayPal details that were registered to your account will be used to take the payment. You may change your payment method in the future. To change your active payment method, you must be making a deposit and have less than £2 in your tombola account balance. Please note that for security reasons tombola does not store your card details in a retrievable format. 2.7.2. Card details are stored using a secure one-way encryption algorithm, which means that the original details cannot be obtained from the encrypted data. The actual card details are held securely by our approved payment provider, which allows us to enable you to process future transactions without the need to re-enter your card details. PayPal provides a secure way to make online payments without sharing financial information. They have an encryption system that will protect your personal details from ever being shared or misused. If you need to change your registered card details (for example, you may have a new card number) then you can do this in the account area or you can contact Customer Services. If you need to change your registered PayPal details, then you can do this by logging into your PayPal account. MasterCard users should also note that withdrawals to a MasterCard are not permitted, so any withdrawals you wish to make can only be paid by cheque. 2.8.1. When you send confidential personal account data (including credit/debit card details) to us, we require that a "secure session" be established first using Secure Socket Layer (SSL) technology. This means that data passed back and forth between your computer and our systems is secured using public key cryptography. Your computer exchanges key information with our servers to create a private conversation that only your computer and our servers can understand. Our links with our payment gateway (a leading UK e-commerce payment company) uses the same technology to transmit any payment information securely. They in turn have secure encrypted links between themselves and all of the major banks to allow the payment to be processed. 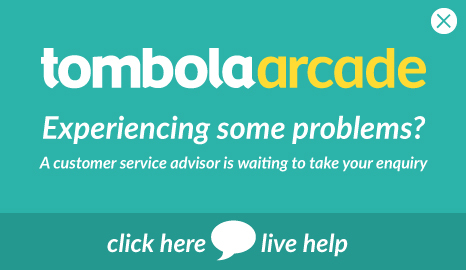 2.8.2. tombola employees do NOT have access to your full credit/debit card details. When you send and receive payments via PayPal we do not have access to any payment details as this is held securely within your PayPal account. It is the intention of tombola that an individual should have a maximum of one account with tombola. tombola prohibits individuals from opening more than one account. One account gives players access to our websites, tombola bingo www.tombola.co.uk and tombola arcade www.tombolaarcade.co.uk including versions of our websites viewed on mobile phones, tablets or other electronic devices (in all cases referred to as the ‘websites’) using the same login details. 2.10.1. It is the Players’ responsibility to keep your personal details private at all times. Players are responsible for all gaming transactions actioned through their account where all personal details have been correct when entered by the person placing the bet. You should also log out when you have finished playing. Where a Player has reason to believe a third party may be in possession of their password and/or account details, the Player is responsible for contacting tombola immediately to register a replacement password. The Player should do this by emailing [email protected] or by calling Freephone 0800 298 8873 / 0330 124 0700, 24 hours a day/7 days a week. 2.11.1. Players are also responsible for keeping accurate details provided at registration up to date. You can access and amend your own individual account information by clicking on "Credit Account", then "Update Card Details" in the "My Account" area of the Website. If PayPal is linked to your tombola account, you are responsible for keeping your PayPal account up to date. If you have any questions please contact our Customer Services, who will be pleased to help you. 2.11.2. Players are responsible for all gaming transactions actioned through their account where the person wagering has entered the correct user name, password and personal question details. Players should not under any circumstances divulge their password or account details to any third party. Interest will not be payable on monies held in Player accounts as these are deemed to be advance payments for intended wagering. 2.13.1. We are required by our licence to inform Customers about what happens to funds which we hold on account for you, and the extent to which funds are protected in the event of insolvency Protection of Customer Funds. 2.13.2. We hold Customer funds separate from company funds in an independent trust account. This means that steps have been taken to ensure that customer funds are repaid to customers in the unlikely event of insolvency. This meets the Gambling Commission’s requirements for the segregation of Customer funds at the level: high protection. You can deposit money into your account to play the Games using VISA/ MasterCard credit cards, Switch/ Maestro, Visa Delta, Visa Electron and PayPal. 'tombola' will appear as a reference on your card statement. PayPal will show a transaction from TOMBOLA GIBRALTAR. You can register a maximum of 4 payment methods on your account. Deposits must be made by using a valid payment method. tombola will not charge you for making deposits/withdrawals, however you should be aware that some credit card companies consider gambling transactions as ‘cash’ payments and they may charge you a cash advance fee. Check with your card issuer for more information. 3.2.1. When you make your first deposit, the minimum amount you can deposit is £10. 3.2.2. When you first register your account, your weekly deposit limit will be set to our site recommended level of £250 per week, locked in place for 24 hours. 3.2.3. Any subsequent deposits can be a minimum amount of £10 and a maximum of £500. 3.2.4. The maximum amount you can deposit is £500 per week however our sites recommended weekly limit is £250. Should your account hold £500 we will not accept any further deposits until your account holds £250 or less. 3.2.5. For Welcome bonus and Promotional terms and conditions click here. We promote winnings paid out to Players as part of our promotional efforts. Publicised winnings are for all winnings paid unless otherwise stated. Winners grant tombola irrevocable right but not obligation to use and publish their tombola username online and in print, any other media or our promotional agencies without compensation. All prizes unless stated otherwise will be cash prizes. 5.1.1. Requests for payment can only be made to your active payment method; either debit/credit card payment, cheque payment or PayPal payment. To change your active payment method, you must be making a deposit and have less than £2 in your tombola account balance. 5.1.2. tombola may refuse payment if a person claiming payment is unable to provide evidence proving their eligibility as the named account holder and are authorised to use the credit/debit card or PayPal which paid for the winning ticket. The minimum withdrawal from a Player’s account is £10 unless a Player is closing their account. If a Player is closing their account, they can request the remaining balance to be paid across to them. Please note that due to administration costs the minimum withdrawal when closing an account is £1.00, any funds less than £1.00 will be forfeited upon account closure. * Documents must be dated within the last three months unless you are providing an annual statement. 5.3.2 Winners may be required to submit valid identification before receiving any prize. For most credit card accounts, payment will be made to your card within the normal banking cycle (usually 3-5 working days). Note if you use a MasterCard we are unable to repay to some cards due to card scheme rules therefore funds will be paid by bank cheque. For larger transactions we reserve the right to ask you to provide us with copies of proof of identity before a payment to your card can be made. The maximum single withdrawal to card is £20,000, any amounts over this can only be remitted by cheque. tombola will not charge you for making deposits/withdrawals, however you should be aware that some credit card companies consider gambling transactions as ‘cash’ payments and they may charge you a cash advance fee. Check with your card issuer for more information. Should you have any questions on the above, please contact our Customer Services team. PayPal accounts payments into your tombola account will be transferred immediately. Withdrawals from your tombola account into your PayPal account may take up to 72 hours to process. For larger transactions we reserve the right to ask you to provide us with copies of proof of identity before a repayment can be made. You cannot withdraw more than £5,000 in a single PayPal withdrawal transaction. If PayPal is your registered payment method then withdrawals can only be made back to the same PayPal account, no other withdrawal method is permitted. Should you have any questions on the above, please contact our Customer Services team. With the exception of the above regarding PayPal withdrawals, any winnings over £20,000 can only be withdrawn by cheque. If you want to withdraw £20,000 or more, your winnings will be sent via cheque to the address registered on your tombola account. Cheque withdrawals take between 3-5 days. Players are also responsible for keeping accurate details provided at registration up to date. You can access and amend your own individual account information by clicking on "My Account Details" in the "My Account" area of the Website. Should you change your surname and/or address you must provide proof of such change before any account details can be updated. If any part of your debit or credit card number changes, including the issue number (where applicable) and expiry date, it is your responsibility to inform us immediately. Failure to do so may result in transactions being declined by your bank, building society or credit card company. We will not accept any liability or responsibility for transactions that are declined as a result of incorrect bankcard details where you have failed to provide us with the changes to your details. Should your debit or credit card be lost or stolen, please contact the Customer Services team immediately. 5.9.1. When making a withdrawal you will be informed of the following: how much bonus money is held in your account, how much you can withdraw without losing bonus money and how much you can withdraw in total. In order to not lose your bonus money, you must keep the same amount of real money as bonus funds in your account. 5.9.2. Should you choose to withdraw the total amount available, then you will lose any bonus funds held in your account. In any circumstances where a stake is deemed to be or is declared void under these terms, any sum deducted from your account in respect of that stake shall be credited to your tombola account. 6.2.1. Automatic playing of Games by software or any other manipulation of the Games or your/another Player’s account data may result in termination of your account, deletion of all associated accounts, and the cancellation of any outstanding prizes and deposits. Players that violate this policy will not be eligible for reinstatement under different screen names until further notice. 6.2.2. Players and visitors to the tombola Websites accept that any tampering by way of, hacking, use of viruses, manipulation of data, use of insider knowledge, or any other method of cheating is a material breach of the Terms and Conditions. tombola retains full rights to recover both, any gains made by person(s) in material breach of the above, as well as any other direct, indirect or consequential losses. Should we decide to waive a rule in the interest of fair play to you, it will not set any precedent for the future. If, for any reason, an individual player loses their connection to the game server then the system will include their purchase in the game as normal and any prizes due will be paid into their tombola account. This will have no effect on the outcome of the game. If, for any reason, an individual player loses their connection to the game server then you will not be able to continue your game on that device until you re-connect to the internet. When you re-connect your game will resume where you left it. A malfunction during play voids all pays and plays, but a malfunction after the Game has finished will result in the prizes being honoured. 8.2.1. We reserve the right to refuse the whole or part of any stake without explanation. tombola reserves the right to verify the eligibility of any winner before payment is made and we reserve the right to refuse payment to any Player who breaches the Terms and Conditions. Bonus money does not contribute to the Game prize pool on any Game that allows bonus money to be used. Players using bonus money can still qualify to win prizes shown on the board including jackpot when playing with bonus money. Please note that if you are the only Player playing a game and using bonus money, there may be no Game prize available to win. However, you could still win the jackpot under the usual rules of each game even when playing with bonus money. For the purposes of the Terms and Conditions, a ‘Dormant Account’ shall mean any Player’s account which, for 2 years or more, has not either (a) has funds deposited in it; or (b) had funds withdrawn from it; or (c) had a bet placed from it; or (d) had a bet settled from it. If your account has been deemed dormant your account may be closed and the sum total of cash held at the time of closure will be donated to charity. You have the right to close your account at any time. To close an account please contact the Customer Service team. On receipt of your request, we will respond within a reasonable time confirming closure of your account but you will continue to be responsible for all activity on your account until such a time as closure of your account has been confirmed to you by tombola. The remainder of your outstanding account balance at the time of closure will be returned to you. 11.1. If we become aware or suspect that a transaction is suspicious and involves or may involve financial crime or similar activity, then we reserve the right to retain the amount of that transaction and any other transaction made by you. In addition, we reserve the right to retain any funds related to that activity and the balance on the accounts in question. We shall be under no obligation to provide you with any reasons for these actions. If the activity and transactions are cleared of any suspicions all retained funds will be made available to you. 11.2. Where we suspect that you are participating in any form of collusion, fraudulent practices or money laundering activities, we reserve the right to report such activity to the police, the relevant authorities and the regulators, online service provider, banks and other financial institutions including details of your identity and you agree to cooperate fully with us to investigate any such activity. 12.1. tombola reserves the right to cancel your account for any reason whatsoever at any time without notifying you. Any balance in your account at the time of such a cancellation will be credited to your credit/debit card or financial account. If it is determined by tombola that you have employed or made use of a system (including machines, computers, software or other automated systems such as bots etc) designed specifically to defeat the gaming system. If we have reasonable grounds to believe that you have participated in any of the activities set out in clause 13.2 above then (in addition to any suspension or termination of your account enacted), we reserve the right to withhold all or part of the balance and/or recover from your account deposits, pay outs, bonuses, winnings that are attributable to any of the practices contemplated in clause 13.2. In such circumstances, your details will be passed to the applicable authority, regulatory body or any other external third parties. The rights set out here are without prejudice to any other rights that we may have against you under these Terms and Conditions or otherwise. 13.1.1. You hereby acknowledge and accept that by using our Websites there is a risk of losing money. We accept no responsibility, nor shall we be liable for any consequences that are alleged to have occurred through your use or misuse of the Websites. 13.1.2. The Websites are provided “as is” and without any express or implied warranty of any kind. Accordingly, to the maximum extent permitted by law, we provide you with the Websites on the basis that we exclude all representations, warranties, conditions and any other terms (including but not limited to warranties of merchantability, non-infringement of intellectual property, or fitness for any particular purpose) which, but for these Terms and Condition might have effect in relation to the Websites. We do not warrant that the material contained in them, or any of the functions contained on the Websites or their servers will operate without interruption or delay or will be error free, free of viruses or bugs or is compatible with any other software or material. In particular, we accept no liability for any loss or corruption of data, communication or lines failure, any person's misuse of the Websites or any error or omission in content. 13.1.3. Our maximum liability to you for any matter arising out of or in connection with your use of the Websites will be limited to the aggregate of the amount legitimately in your account and the return of the amount of the stake of any disputed bet. and whether in tort (including without limitation negligence), contract or otherwise in connection with the Websites in any way or in connection with the use, any inability to use or the results of the use of the Websites including but not limited to loss or damages due to viruses that may infect your computer equipment, mobile handset, tablet, software, data or other property on account of your access to, use of, or browsing of the Websites. 13.1.2. You agree to indemnify and hold us, our officers, directors, agents, employees harmless (and keep us so indemnified or held harmless) brought against us by any third party from any liabilities, costs, claims, actions, proceedings, damages, expenses (including legal costs and expenses) losses or demands whosoever arising, suffered or incurred by us as a result of your breach of these Terms and Conditions or any documents incorporated by reference into this agreement or out of your violation of any law or the right of any third party. 13.1.3. We will not be liable for any loss or damage that you may suffer because of any act of God, power failure, trade or labour dispute, act, failure or omission of any government or authority, obstruction or failure of telecommunication services or networks, access delays or access interruption, data non-delivery or data miss-delivery, the unauthorised use of your security access details or any other delay or failure caused by a third party. In such an event we reserve the right to void any bet or cancel or suspend our services arising from such circumstances without incurring any liability. Furthermore, we will not be responsible for the failure of any equipment, wherever located or administered, or whether under our direct control or not, that may prevent the operation of our Websites, or prevent you from being able to contact us. 13.1.4. Nothing in these Terms and Conditions shall exclude our liability which we may have in respect of fraud or death or personal injury arising from our negligence. 13.1.5. You acknowledge that we will hold information with respect to your identity, including, but not limited to your name, address and date of birth. You agree that we rely on this information in entering into this agreement with you, and you accept that we have no liability whatsoever against any inaccuracy or falsehood contained in the information as provided by you. 13.1.6. Unless otherwise stated, we are the owners and authorised users of all intellectual property rights in all materials on the Websites and all its content including, without limitation, any copyright, trademarks, text, photographs, videos, logos, designs, codes, templates, specifications and any modification, improvements, enhancements thereof. These intellectual property rights are protected by the laws of England and Wales, international treaties and all other applicable copyright and intellectual property laws. If you breach any of the terms your permission to use the Websites shall automatically terminate and you must destroy any downloaded or printed extracts from the Websites. 13.1.7. Any rights not expressly granted in these Terms and Conditions are reserved. All content and materials on the Websites are provided for your own personal usage, thus the reproduction, distribution, or commercial exploitation of such content or materials in any manner whatsoever without our express and prior written consent is prohibited. Any other use or reproduction of any such materials without our prior written consent will constitute a breach of these Terms and Conditions. 13.1.8. It is strictly prohibited to collect any data from us by screen scraping or any other automated or manual collection. It is also prohibited to use any data from the Websites without our prior written permission. 13.1.9. For the avoidance of any doubt, you may use the data available on the Websites, only as strictly required for your permitted personal purpose of availing of our service. We reserve the right to take such action as we consider necessary, including issuing legal proceedings without further notice to you, in relation to any unauthorised use of our data, or of the Websites. 13.1.10. We will not be responsible or liable for the content, accuracy, timing or reliability of any information, statement or services offered by third parties, advertising or otherwise posting information via our Websites (whether directly or via links to or from other websites or resources), nor do we endorse the contents of such advertisements or information. If you have any claim arising from the actions or statements of a third party, you agree to pursue such a claim only against that third party and not from us. We do not accept liability for damages which may be caused by the interception or misuse of Players’ credit card details on the internet. 14.1. tombola is regulated by the Gambling Commission of Great Britain (licence number 00-038613-R-319397-008) and Gibraltar Gambling Commissioner (licence number RGL 052). 14.3. All material contained within the tombola Websites are the copyright of tombola. The trademarks displayed on the tombola Websites are the property of tombola. Use of any trademarks or copyright without written permission is strictly prohibited. 15.1.1. tombola endeavour to give you the best possible service and strive to get it right at all times. Should you feel that we have failed to offer our best the following is a step-by-step guide to our complaints procedure. 15.1.3. We will email you to confirm we have received your complaint and provide you with details of the person dealing with it. 15.1.4. What happens next? We will investigate your complaint with the department concerned and if they cannot resolve the problem or if you are not happy with the outcome you can make an official complaint. 15.1.5. Official complaints will be escalated for management to review, they will investigate and provide a final response. 15.1.6. If you are still not satisfied with the outcome you may escalate the matter externally to the Independent Betting Adjudication Service (IBAS). 15.1.7. IBAS acts as an impartial adjudicator on disputes that arise between betting / gambling operators and their customers, after they have been through the operator's own internal dispute procedures. The IBAS panel of betting experts apply their specialist knowledge to the facts and will adjudicate by reference to these Terms and Conditions but do not rule on complex legal issues. As well as offering effective dispute resolution procedures, IBAS also check that we have complied with the standards set by the appropriate regulatory bodies and with the IBAS Terms and Conditions of registration. 15.1.8. IBAS can be contacted at www.ibas-uk.com or via telephone on +44 (0)207 347 5883 or via post at IBAS, PO Box 62639, London EC3P 3AS. 15.1.9. You may refer a dispute to IBAS at any time following the conclusion of our review of the dispute, so long as this is within six months of the date when the dispute arose. 15.1.10. Without prejudice to any legal rights, IBAS rulings are binding on both parties to a dispute, on the understanding that full facts are presented by all the parties involved. 15.1.11. You can also use the ODR platform but this will take you to the aforementioned alternative dispute resolution service (IBAS) and may prolong the process of resolving your dispute. Monthly Limits – Minimum you can set is £10 – Maximum you can set is £2,500. This is due to some months containing five weeks. Please note, you may only deposit a maximum of £500 per week. 16.1.2. If you increase your deposit limit, you must wait 24 hours, after which you must confirm the value increase, for immediate implementation. If you decline the increase, your deposit limit will remain as the previously selected value. 16.1.3. If you have locked your limit into place, you will not be able to increase your limit until the lock period has elapsed. 16.1.4. If you decrease your limits they will immediately come into effect regardless of any lock features. 16.1.5. For further details on our financial limits please see our Responsible Gaming Page. If you wish to restrict your gambling for a short period of time (up to five months) you can do so by going to ‘My Account’ and ‘Play Responsibly. We will temporarily close your account and you will not be able to access it. For further details on time outs please see our Responsible Gaming Page. Game freeze gives you further control over the games you play on the sites. If you no longer wish to play you can freeze that game in question. You can choose as many as you wish by ticking the box next to the game you wish to freeze, within the ‘Play Responsibly’ section on the sites. To unfreeze a game you will have to wait 24 hours before you can play the game again. You can choose to increase/decrease or switch off time keeper at any time. 16.4.1. At tombola, we want everyone to enjoy playing our games. However, we do recognise that some Players would wish to restrict or even cease playing. We therefore provide a self-exclusion facility that allows Players to close their account for a minimum period of six months, up to 5 years, and then permanently. To do this simply log in and go to 'My Account', and then click on 'Play Responsibly'. Alternatively, you may contact our Customer Service Support team directly by phone on Freephone - 0800 29 888 73/0330 124 0700. Our Customer Services team receive problem gambling and social responsibility training through our association with Gamcare. 16.4.2. When choosing to self-exclude, you will not qualify to receive any bonuses or promotions we may offer during your self-exclusion. Within two days of choosing to self-exclude, you will also be excluded from any marketing material that we may send. No further marketing material will be sent until the self-exclusion period is over, and you have requested to return to the Website. If you choose to permanently exclude yourself from the Website, this will be permanent and we would never reactivate your account for any reason. Please note when applying any of the above Responsible Gambling tools they will apply all sites. 16.4.3. Once you choose to self-exclude your account will be closed for the duration of the selected period, and you will no longer have access to the games or any of the features within “My Account”. We will return your remaining account balance in accordance with our withdrawal policy. Once a request to self-exclude has been made the decision is irreversible. Please note that tombola maintains a register of all self-excluded accounts including payment methods and all self-exclusion agreements, for the duration of the self-exclusion. 16.4.5. During a self-exclusion agreement, we will employ reasonable automated checks to endeavour to ensure that you can no longer transact with tombola accounts. However you must not attempt to gamble with us, and we cannot be responsible or liable for any subsequent consequences or losses (howsoever caused) that you may suffer or incur if you continue gambling through additional accounts where you have altered any of your registration details or you provide misleading, inaccurate or incomplete details or otherwise seek to circumvent the self-exclusion. 16.4.6. If you choose to reopen your account once the self-exclusion period has ended you will be required to contact the Customer Services team via telephone. You will then be given a minimum 24 hour cooling off period before your account is active. Whilst the 24 hour cooling off period is in place you will be given the option to cancel the reactivation. If you choose to self-exclude for any period between 6 months to 5 years and decide to return when this time period has elapsed your deposit limit will default to a maximum of £250, locked in place for a minimum of 24 hours. If your existing deposit limit is less than £250, it will remain in place, if your existing deposit limit is greater than £250, then the 24 hour minimum will remain in place. We reserve the right (in our sole discretion) to refuse to register you and/or to suspend and/or terminate your account at any time and/or to refuse to accept any bet or transaction in respect of or in connection with your use of the Websites. We shall not be obliged to provide you with any reasons for so doing and shall not be liable to you in any way for any loss or damages that may result from any such action. We reserve the right to refund to you or withhold any payment of monies from or into your account if there is manipulation of our financial system or suspicion or evidence thereof or a breach or suspected breach of any applicable law, regulation or any of these Terms and Conditions, in each case without providing any reason. Use of any account otherwise than in accordance with these Terms and Conditions or any other abuse of any account is strictly prohibited. We reserve the right to withdraw your use of any of the Websites at any time, subject to fulfilment of any outstanding commitments under these Terms and Conditions. These terms shall be governed by and construed in accordance with the laws of England and Wales. Persons located outside the United Kingdom are prohibited from using the websites. This prohibition may be changed by us from time to time with or without notice. The presentation by us of any Services does not constitute an offer or invitation for the use of the Websites in any jurisdiction outside the United Kingdom. It is your responsibility to fully completely with laws concerning gaming in the jurisdiction in which you are located. If you live in a country which prohibits gaming you must not register with us, or attempt to use our services. Accessibility of the Websites in any jurisdiction outside of the United Kingdom shall not be construed as a representation or warranty with respect to the legality of use of the Websites in that jurisdiction. No winnings shall be paid to you in respect of the use of the Websites whilst you are located outside the United Kingdom. We reserve the right to terminate your account and refuse any and all current or future use of the Websites if we suspect or know that you have been using it whilst located outside of the United Kingdom. 20.1. We reserve the right to revise or amend the Terms and Conditions. We will notify of any material changes to the Terms and Conditions prior to the change coming in effect. If you do not agree to be bound by the changes to the Terms and Conditions, then you should exit the Websites. 20.2. No Customer Service representative has the power to amend these Terms and Conditions. Read our Promotional Terms and Conditions here.